This animation shows the explosion of a white dwarf, an extremely dense remnant of a star that can no longer burn nuclear fuel at its core. 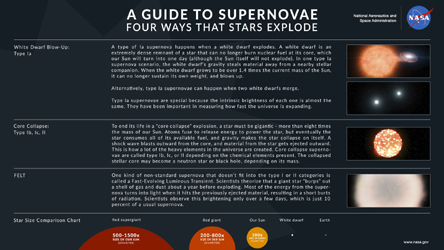 In this "type Ia" supernova, white dwarf's gravity steals material away from a nearby stellar companion. When the white dwarf reaches an estimated 1.4 times the current mass of the Sun, it can no longer sustain its own weight, and blows up.